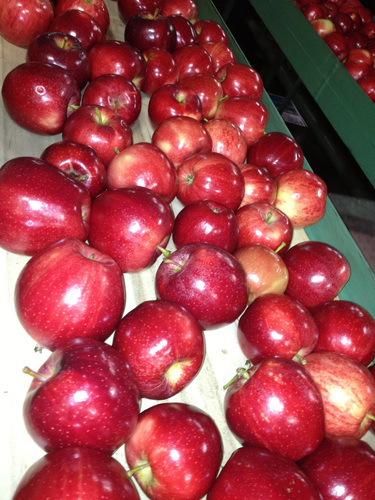 Red Delicious are forecasted to start coming off the trees this week; so look for a well-rounded manifest next week with 2013-2014 Fresh HoneyCrisp, Granny Smith, Jonagold, Gala, Fuji & Golden Delicious Apples available to ship. Last week Sky Johnson, the newest member to our Sales & Marketing team, was able to head out to a few of the farms with 3rd and 4th generation Owner & Operators; Bill and Byron Borton. 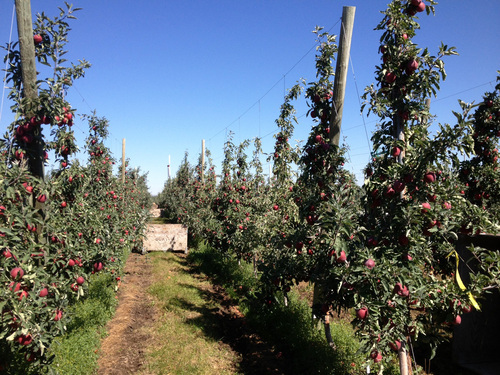 The first stop was at our Ephrata Region Ranches taking a look at some new crop Gala Apples. As you can see below, the color was outstanding, looking as though they had a hue of purple. The pictures below show the fruit in the orchard, and then later being packed on the Borton main packing line. Though the Weather this growing season has been a bit of a challenge; we are really looking forward to the forecast this week, seeing the first sub-50 degree temperatures. With the first fall like feel in the air; hopefully this change will increase the color on the fruit. Cold nights greatly benefit the color and flavor. For any further updates and inquiries, please contact our Sales & Marketing team.